If you are a current member of ASCTA, please click here to login and receive members discounted prices. ASCTA carries all products listed on the order form in stock and processes twice weekly. and send to the asctaSHOP. 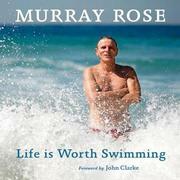 Life is Worth Swimming is an intimate glimpse into the personal journey of Australian swimming icon Murray Rose—his life, his stories and his innermost thoughts. Throughout the book, enchanting images—some nostalgic, some recent and many from his private collection—document his life, highlight his words and bring the events described into sharp focus. Those who lived through the “golden era of swimming” will delight in revis­iting Australia’s astonishing achievements and revel in the inside stories—including stories of some highly controversial moments—which could only be shared by someone who was there. Others, who have only heard about this magical era, will discover one of Australia’s greatest sporting heroes—while anyone with a philosophical bent, or anyone who wonders what makes an athlete tick, will find deeper meaning in Murray’s words. Commenting on sport, focus, philosophy and family, this highly engaging and accessible book provides insight and inspiration not only for athletes, but also for anyone who has ever pondered life’s important questions. A winner of 6 Olympic medals (includ­ing 4 gold medals), 4 Commonwealth Games medals and holder of numerous world records during his career, Murray Rose was a swimming legend—so much so that he was often referred to as “the greatest swimmer of all time”. Murray Rose held a lifelong fascination with Australia’s beach culture, becoming an active member of North Bondi Surf Club and pursuing his passion for ocean swimming. He was also a highly respected and deeply committed Patron of Rainbow Club Australia. Murray passed away in 2012 from acute advanced leukaemia. He wrote this book before his diagnosis. Please note you are now leaving ASCTA online Shop.